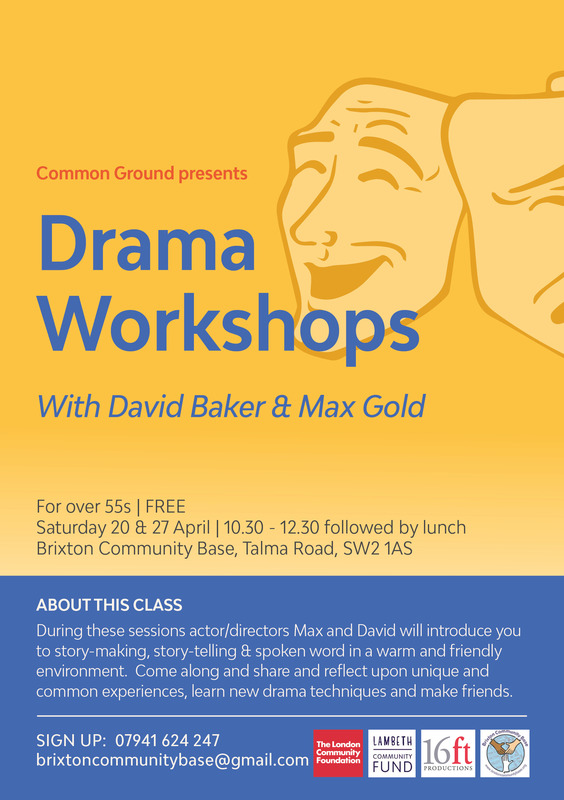 On Saturday 20th and Saturday 27th April, Brixton Community Base will be hosting two drama arts workshops for over 55’s. These workshops are part of the ‘Common Ground’ programme of arts and wellbeing workshops which include Tai Chi, creative writing, arts and crafts and yoga. The drama workshops will introduce you to story-making, story-telling and spoken word. No experience necessary. These are warm and friendly workshops with the emphasis on participants building confidence, learning new skills and making friends. Workshop times: 10.30-12.30, followed by a light lunch.